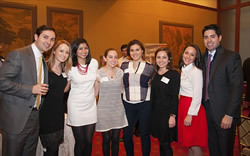 SMU Chapters foster the connection between the University and its alumni, parents and friends outside of Dallas though meaningful programming. Participation in Meetings: Chapter Leaders have two scheduled planning periods per year, one in June (at the beginning of the University’s fiscal year) and one in January (toward the end of the University’s fiscal year.) Chapter Leaders meet either in person or by conference call to work with their staff liaison on planning their event calendar for the year. Planning Chapter Events: Depending on the size of the SMU community in your city, members of the Leadership team are expected to help plan and coordinate 1-4 events per year for their alumni base. This includes securing venues, event details, and working with a staff liaison in the Alumni Office to publicize events and track RSVPs. Attend Events: Chapter Leaders are expected to attend all Chapter events as representatives of the Leadership Team. Chapter Leaders also have the opportunity to represent their alumni base at local SMU Admission events, including Accepted Student Receptions, Send Off parties, or College Fairs. Make an Annual Gift to SMU: As representatives of the University, Chapter Leaders are expected to make an annual gift to SMU to a designation of their choice. It’s not what you give, but that you give that is most important. Learn more about giving to SMU. Time commitments vary according to chapter group. Chapters in cities with large SMU community traditionally host 4 events per year, while those in international cities and those with smaller communities host at least 2 events per year. The time commitment for Chapter Leaders will be between 1-3 hours per month. Become part of your Local Chapter Leadership Team today! Fill out our online interest form so we can tell you more about your local Chapter and expectations for its Leaders. View a list of active Chapters by clicking here. Don’t see an active Chapter in your city? Consider starting one! E-mail us at smualumnichapters@smu.edu to receive more information and learn about the next steps in the process. View upcoming Chapter Events by checking out our Events Calendar.